Altavilla shortened his leg kick and started using the same grip and approach James Paxton uses for his slider. It has propelled him into the Mariners most effective reliever this spring. PEORIA, Ariz. — If a pitcher — reliever or starter — struggles and puts up poor results in the Cactus League, there’s often one of a variety of reasons listed as the cause behind it. Just trying to build the pitch count and not show too much to hitters. Within reason, all of these are somewhat acceptable and logical causes of a statistically bad outing. And sometimes a pitcher just doesn’t have it. But what if a pitcher is putting up outstanding results, striking out hitters and not allowing hits or runs in Cactus League play? Is that somehow lessened because perhaps he’s facing minor league hitters, or because pitchers are ahead of hitters early in the spring? 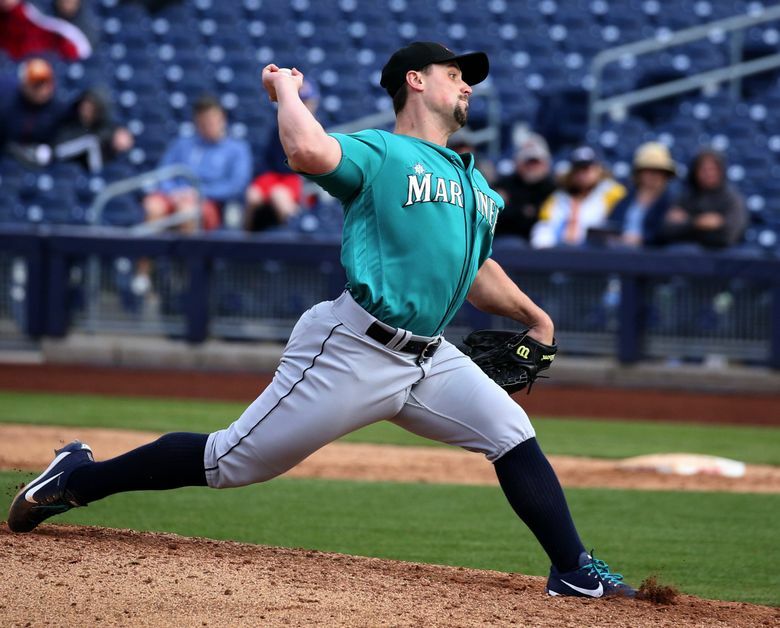 Regardless of the results, there has been no Seattle pitcher that has looked stronger in the first few handful of spring training games than reliever Dan Altavilla. The hulking right-hander, whose build is part power lifter and part linebacker, has made two one-inning appearances this spring, striking out five of the six batters he’s faced. “We’re seeing a different guy right now,” manager Scott Servais said. Indeed, Altavilla might be finally finding the consistency in his mechanics and in the command of his slider to make him the type of solid set-up man the Mariners envisioned following his September call-up in 2016, where he allowed just one run in 15 appearances. He certainly wasn’t that pitcher last season. There were moments. A three-outing period of dominance early in the season was nullified by a breakdown of command and mechanics and eventual demotion to Class AAA Tacoma. It started off what would be a season of ups and downs on the mound and from the big league club back to the Rainiers. Teams figured out that he lacked command and waited him out in at-bats, putting him in bad counts and forced him back into the strike zone. He made 41 appearances with the Mariners, posting a 4.24 ERA with 52 strikeouts and 20 walks in 46 2/3 innings pitched. 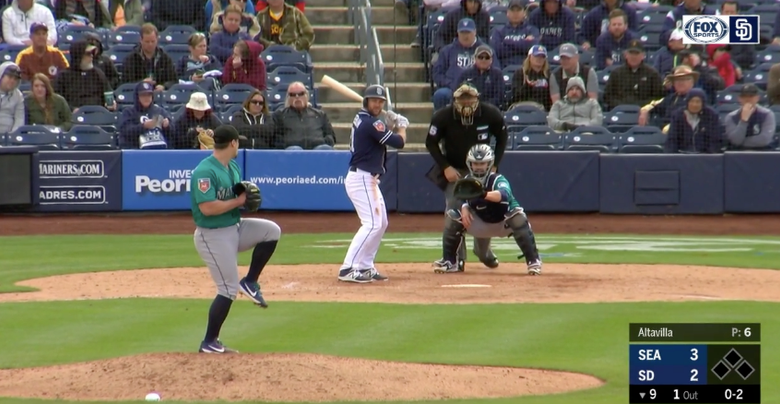 He was just never was consistent enough to be the power arm in the sixth to seventh innings that the Mariners had hoped for prior to the season. It stemmed from the basics. “My confidence was there, but the delivery wasn’t,” he admitted. The breakdown wasn’t health related. It was trying to do more than necessary. Trying to make adjustments and re-find yourself at the big league level isn’t simple, particularly for a pitcher with minimal experience like Altavilla. He started to make adjustments during his many trips back to Tacoma, refine them in the offseason and have them ready for spring. 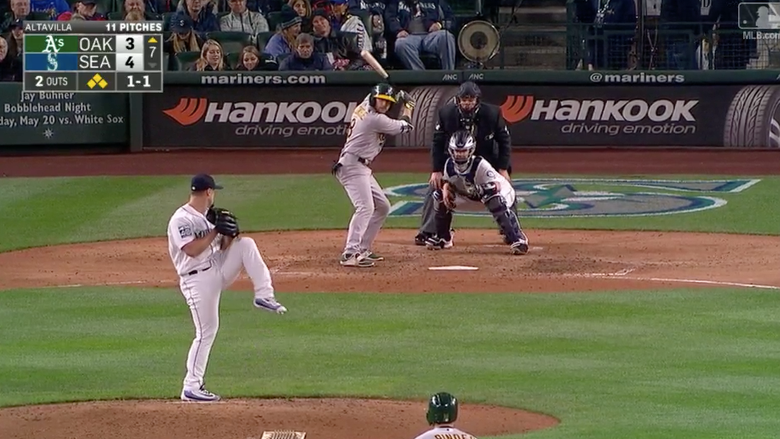 The Mariners have shortened and compacted his delivery, specifically his leg kick. He’s lowered it and also incorporated a no-leg kick, slide-step when runners are on base. It took a little convincing with the help of Trackman technology, which is a 3-Dimensional Doppler Radar that produces a sample rate of 48,000 measurements per second, to prove to him he wouldn’t lose velocity or spin rate on his mid-90s, four-seam fastball that has the potential to touch 99 mph. But it isn’t just the better direction to the plate that’s also been beneficial. Altavilla began experimenting with a new slider grip and way of throwing it last season. He basically stole it from teammate James Paxton. Paxton was just offering advice to a fellow pitcher. There’s a lot of down time in baseball and pitchers tend to discuss pitching mechanics and pitch grips on an almost obsessive basis. “I was just talking to him about how I hold the ball and where I put my fingers on the seams and also that I preset my wrist on my cutter/slider to allow me to throw it like a fastball,” Paxton said. “I set my wrist and angle it and come through. Instead of having to have this (twisting his wrist) all coming through at a perfect time, it already has that angle that you want to have and you throw it like a fastball. The hitters can’t see it because it’s going too quick. Paxton got the idea of presetting his wrist from pitching coach Mel Stottlemyre. So Altavilla took Paxton’s method and worked with Stottlemyre on a plan to implement it. There was some experimentation with it during bullpen sessions, but not much immediate success. After being sent back down again at the All-Star break, he decided to permanently commit to the new grip and approach. It’s impressed Servais early this spring. With the additions of Juan Nicasio, who slated for a setup spot, and the acquisitions Nick Rumbelow and Shawn Armstrong, Altavilla isn’t guaranteed a spot in the Mariners’ eight-man opening day bullpen. But he’s in a better position now to have consistency if he does.